We have good news! Apple AirPods are finally available to order on Apple with shipments available as soon as the next day. It took, well, forever really, but it finally happened. But wait, we have even better news! 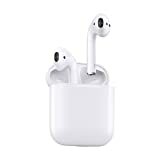 The Apple MMEF2AM/A AirPods Wireless Bluetooth Headset is back in stock at a discount on Amazon. Why on Earth would you buy them from Apple when you can get them from Amazon and pay less? Sorry, Apple, you tried your hardest though.